The new Peugeot Ion Hatchback is a cute, dinky, all-electric city car that sports four seats and a small but willing petrol engine. Its electric motor develops up to 64bhp, and can keep going for 93 miles on a single charge. It’s a car for trailblazers who want to make the transition to a fully EV. Space-age aesthetics are complemented by low running costs, which offer a good contrast to the somewhat high starting price. If you want a modern electric car for the commute to work, it’s a strong contender. OSV takes a closer look at what it’s all about with our 2017 Peugeot Ion Hatchback review. The Ion might not be the quickest car in the world, but it feels sprightly in the town thanks to its motor coming without any moving parts that take a bit of time to wake up. As such, all of its torque is available right away and keeping up with traffic is a piece of cake. The Ion is rear wheel drive, and its 64bhp electric motor delivers more than enough power to help you get out and about with ease. Take it onto the motorway, though, and it will begin to struggle. You will need to stick to the inside lane to avoid being totally overwhelmed by saloons and SUVs. It comes with just the one gear, which works in its favour. It’s a lot smoother to drive than any automatic transmission you’ve tried previously. And while you can always feel the bulk of its batteries, they’re hidden under the floor, ensuring that body roll is kept to a minimum. The brakes are strong and sturdy, and send power back to your batteries. A major plus is that the Ion Hatchback barely makes any noise, making it refined in the city. Visibility is good thanks to the high driving position, although a glaring deficiency of the car is its tall shape and skinny tyres. When cornering too enthusiastically, they cause the car to get a bit flustered. No other car looks like the Ion at the moment, with the exception of the Mitsubishi i-MiEV, which is its sibling. The Ion’s front bumper has been modified to make it distinguishable, and it gets 16” alloys. Its large windscreen is a bonus for the drive. It’s undeniably small, but Peugeot has done a good job of getting the most out of its compact dimensions. The Ion can fit four people, visibility is good, and the rear seats split. However, in terms of quality, the car doesn’t fare as well as rivals. We like the piano black insert that’s fitted to the centre console, but apart from that the plastics used are hard, scratchy and cheap. The cabin is as basic as basic does, and there are scant luxuries. For over £20,000, you expect more. Insulation is decent, but there are a few whistles here and there as you accelerate, while tyre noise is a bit of an issue. In terms of how practical it is, you only need to take one look at it to know it won’t be super useful. That said, it’s just fine for commuters. The driving position is excellent, as is headroom. The rear seats are fine for adults on shorter journeys, but backseat passengers are likely to get grumpy on longer trips. The boot, meanwhile, measures 166-litres. That’s decent for a car of this size. Moreover, the rear seats can be folded flat for more luggage space, but there is no parcel shelf. There is just the one trim level available, and standard kit is reasonable. The car does without a number of luxuries afforded to rivals, but it does get electric front and rear windows, a leather steering wheel, Bluetooth, electric folding door mirrors, front fog lights, and remote central locking. The Ion is similar to the Peugeot i-MiEV in a lot of regards, but its safety has been boosted by the addition of electronic stability control. It also gets plenty of airbags, anti-locking brakes, traction control, seat belt warning, and active stability control. It only scored four out of five when crash tested by Euro NCAP, but thanks to Peugeot Connect SOS, you can get in touch with an emergency call centre at just the touch of a button. Prices for the new car start out from just over £20,000. For more information on our leasing deals, check out our page here. Running costs are good, primarily because this is a fully electric car. You will need to pay two quid in electricity, and a full charge lasts for as much as 93 miles. That’s pretty good. And because Peugeot dealers offer fast chargers, you can charge about 80% of your batteries in just half an hour. There is no road tax to pay, and the Ion is exempt from the London Congestion Charge. People often talk about Kia’s outstanding seven-year warranty – and for good reason. But here Peugeot is offering an impressive eight years. All the Ion’s power is delivered in an instant, so you’ll have no problem keeping up with traffic. 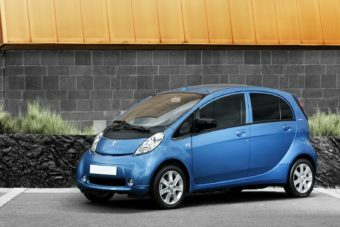 Smooth, easy to drive and no need to be refilled at the pumps, the Ion is a fabulous city car. 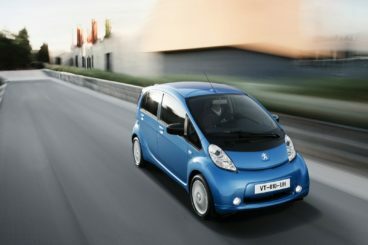 Like its rivals, the Peugeot Ion is more expensive than a conventional city car. The motorway is far removed from its natural habitat. Let’s see how the car fares against its rivals in the comparison section of our 2017 Peugeot Ion Hatchback review. 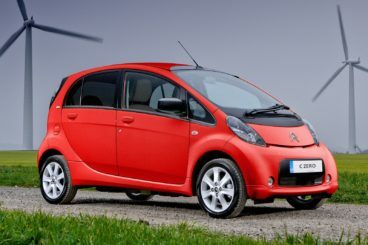 The new Citroen C-Zero is cute, compact and cheap to run. Like the Ion, it’s not massively powerful, with its electric motor capable of just 64bhp. But that’s all you really need in and around town, and the C-Zero Hatchback goes about its business without any hassle. And the city is really where it excels, primarily due to having a charge of a modest 93 miles. It’s nippy in a straight line, thanks to all its power being available as soon as you start it up, while its compact dimensions mean that it can negotiate tight turns with ease. That said, its max speed of 80mph means it’s not totally incompetent outside towns and cities. Like the Ion, it’s all electric, which means there’s no need to worry about fuel costs. You can get out and about for 93 miles for just two quid. It’s also free to tax and exempt from the London Congestion Charge. Other benefits of being all electric extend to its cabin, where it’s whisper quiet. In fact, you’ll be hard pushed to find a quieter car on the road at the moment. However, the faster you go, the noisier it becomes. Tyre noise is a slight issue, while the electric motor begins to emit a high-pitched whirring noise. Four people can squeeze inside, and headroom is good for all. The seats are comfy enough, but it’s unfortunate that they feel a bit cheap. How practical you find the car will really depend on how annoying you find day-to-day charging. It’s less expensive than filling up a conventional car with petrol or diesel, but also less convenient. Because the charging cable can only be plugged into a mains socket directly, you can’t simply charge it anywhere you like. Moreover, to do a full charge you’ll need to wait 7 hours. The boot, meanwhile, measures a paltry 166-litres. That’s the exact same size as the Peugeot Ion, with both boots big enough to carry your shopping – provided you don’t do a big shop, that is. The rear seats do fold flat to reveal more boot space, but the opening is on the small side. The new Nissan Leaf Hatchback is one of the most popular all-electric city cars, and has been ever since its launch. However, it’s super expensive. 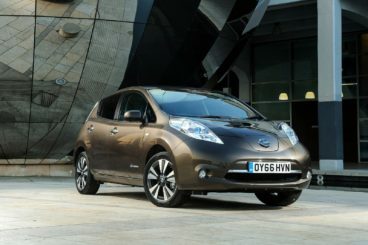 On the road, the Leaf is much like the Ion – quiet, comfortable, and perfect for the town. Its suspension is nice and soft, and it does a good job of absorbing lumps and bumps from coarser road surfaces. Of course, overly soft suspension has a trade-off, and body lean in bends is excessive. And thanks also to light steering, the Nissan Leaf Hatchback is not a car to be driven with a lot of enthusiasm. Its electric motor can offer more power than the Peugeot and the Citroen – up to 108bhp, in fact, which is almost double the amount of power in the Ion’s tank. And because all of its power is delivered right away, acceleration is good, with 0-62 completed in 11.5 seconds. Max speed is 89mph, ensuring the Leaf can keep up with traffic without being embarrassed. And like the Peugeot, it’s almost strangely too quiet. So quiet, in fact, that you’ll hear everything, including potholes. In terms of running costs, there is only really one thing you need to worry about, which is the price of replacing a battery. A new one costs almost £4,000, but you can lease one by paying a monthly fee starting from as little as £70. How much you pay exactly will depend on the length of the lease, as well as your annual mileage. There are two batteries available, a 24kWh, which lasts for 124 miles on a full charge, and a 30kWh, which can go for 155 miles on a full charge. Both last significantly longer than the Peugeot. However, these are official numbers only. Unless you drive like a saint all the time, you’ll struggle to achieve them regularly. Apart from that, there is no yearly road tax to pay and the car is exempt from the London Congestion Charge. Inside, the Nissan Leaf Hatchback’s cabin is ultra quiet, with barely any road or wind noise getting in. Add the soft suspension, and this is a relaxing way to get about the town. It’s easy enough for the driver to get comfortable, thanks to plenty of adjustability. 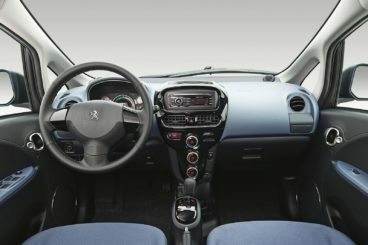 The dashboard sports a clean and simple design, with the brand’s Connect EV infotainment system dominating. You can use this to operate your smartphone and its apps. Go for the Acenta model, and you benefit from an attractive 7” colour screen. In terms of how practical it is, again it suffers from the problem all EV’s do, and that’s the hassle of finding somewhere to charge each day. It takes eight hours to do a full charge, and unless you can find special charging stations all the time, you’ll be doing most of your charging at home. That aside, practicality is decent. Four adults benefit from a good amount of leg and headroom, and storage space is decent. The boot, meanwhile, totally eclipses both the Peugeot and the Citroen, and measures an impressive 370-litres. A high lip is awkward and the rear seats can’t be folded totally flat, though. In many ways, the new Ion is the perfect city car for the modern commuter. It’s fully electric, easy to drive in tight corners, and super sprightly. However, it’s the price tag that will put some buyers off. If your budget extends far enough, the new Peugeot Ion Hatchback is one of the leading lights in EV and city car technology. Will you be one of the first to join the revolution?